Have you ever bought a bead that was advertised as Murano glass, just to find out that it was a cheap imitation? Glass of Venice feels that should never happen! Julia Grinberg writes, "Not only is this unfair to the clients, it endangers the future of real Murano glass - an invaluable piece of our global heritage. We are passionate about Venice and Murano glass and do all it takes to preserve and promote this amazing ancient art across the world." Glass of Venice is the final new winner of our sponsorship contest that I am adding this month. 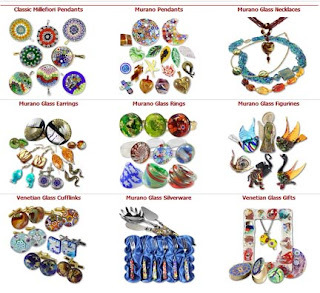 They specialize in authentic Murano glass jewelry, accessories, and home decor imported directly from Venice, Italy. You'll find their banner ad over in the sidebar. Please visit them to feast your eyes on some true glass beauty!